RARE! Anitique replica by Master Carver S. Yanik. 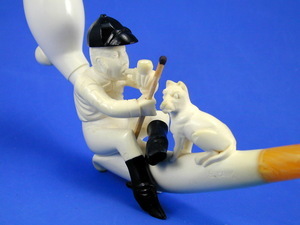 Pipe smoking Jockey with black cap and boots and his dog. Holds a match stick. Coloring bowl and charoot holder included. L = 7.25in. / 18.4cm. H = 3.25 in. / 8.2 cm. W = 1.3 in. / 3.4 cm. Weight = 2.2 oz. / 62 g.